Today we welcome a G&F author with a big heart and a lot of courage. Shawn Lamb first joined us in November, and I have come to appreciate her determination and creativity as our paths have come together. I can’t wait for you to meet her, so let’s get started! Shawn, we’d love to hear a little about who you are apart from the writing. Before being published, I was a scriptwriter for an animated series called BraveStarr. I worked as an EMT and on Search and Rescue teams. I was a fencer. In fact, I was cast as the fencing stunt double for Bo Derek in a pirate movie back in the 80s, but it feel through just as we started choreographing the first fight scene. But my fencing background comes in very handy in my books. I’ll bet. Your books look fascinating. How did you become a Christian writer? I’m a Christian first and foremost, and have been since I was 14. Writing is merely a talent God graciously gave me. I would be remiss not to use my talent for Him. Nor could compartmentalize my Christian walk from my writing, it would be disingenuous to God and readers. So, who are some of your greatest influences either writing or personal? The greatest help in my writing was studying for 3 years with Doug Hirt through Jerry Jenkins’ Christian Writer’s Guild. I learned a lot from Doug, who is the author of over 30 books in both the CBA and ABA markets. Personally, it would be my daughter. She requested I write her a fantasy and that is how the YA series Allon came about. I was writing Christian historical fiction when she asked, but each time I got near being contracted by publishers – Christian or one of the Big Six – it would fall through. So Allon became my breakthrough with book 1 traditionally published and released January 2010. 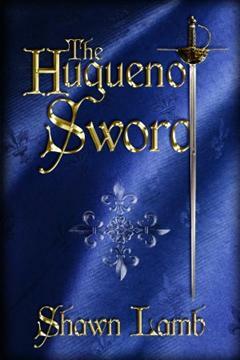 Once it was established, I returned to my love – historical fiction with The Huguenot Sword, which is the first book I ever wrote and started when I was 16. Serve God and love your family. There is no great source of strengthen than God, and no greater support and satisfaction than in cultivating a Godly family. Right now I’m working on multiple things. I’m preparing for my events, which generally run from April through September. I’m also in the final stages of preparing Allon Book 5 – Gauntlet for release and working on a new Christian historical fiction for release later in the year. Gauntlet. You always have such cool names for your books. They always make me want to free the princess, kill the dragon, or maybe that’s vice versa. 😉 I know a little about your previous books, but I know our readers would love to hear about them. When I’m not at events, I’m constantly working on new projects or polishing old manuscripts. I plan on releasing the remainder of the Allon series over the next 2 years – there are 9 total books. I hope to include an historical when time and production allow. I also blog about writing and the publishing industry. Currently, I’m doing a series called From Book to Screen, where I take my award-winning Hollywood screenwriting experience and discuss the book/movie option contract, book adaptation, screenwriting tips, and what works and what does by comparing the movie to the original book. Awesome! Before our last question, I have to share something with our readers. A month or so ago you shared some photos with us of your daughter in character as the character I believe in your Allon books. I loved those photos. I know our readers would too. This addition has been a bit hit with people. It’s called “Shannan and Torin” (Torin is the wolf, and he’s REAL!) Check these out! You have one brave and beautiful daughter there! So where else can our readers find you on the net? Many places. The best place to start would be my website. I have an email newsletter sign-up on the site so readers can receive news on my latest releases and where I’m going to be. My books are available in paperback, Kindle and Nook. More about Shawn Lamb: Beginning her writing career in television, Shawn wrote for Filmation Studio’s series BraveStarr. She won several screenwriting awards including a Certificate of Merit from the American Association of Screenwriters. Recently she became a winner in The Authors Show contest 50 Great Writers You Should Be Reading for 2011. She currently lives in Nashville with her husband Rob and their daughter, Briana.